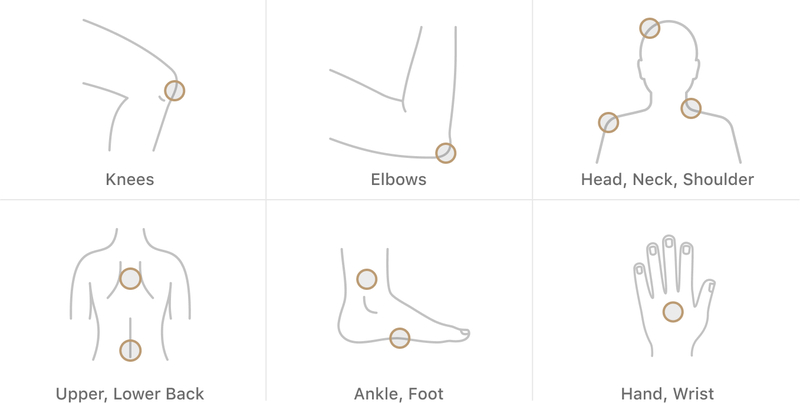 Electricity is everywhere, even in the human body. Our cells are specialized to conduct electrical currents. Electricity is required for the nervous system to send signals throughout the body and back to the brain — making it possible for us to move, think, and feel. 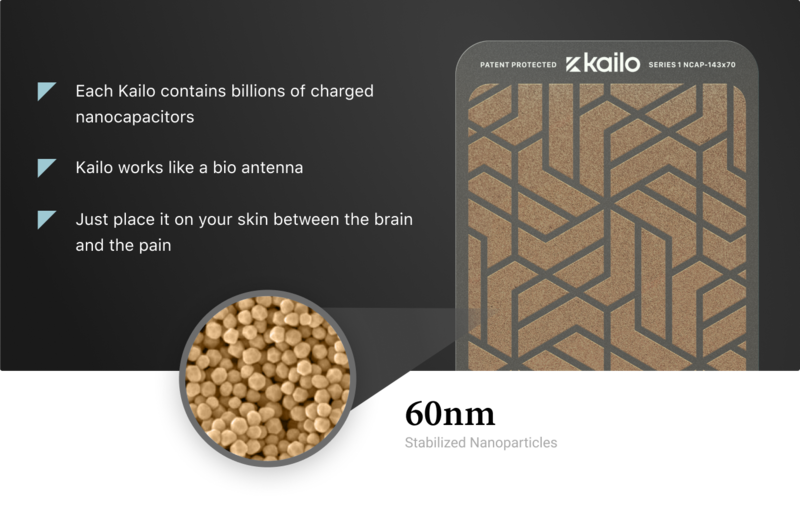 The Kailo™ nanocapacitors work in harmony with your body’s electrical system like a bio antenna. You may even feel your Kailo begin to get warm as your nervous system responds. Now, once the pain and discomfort is managed, your body can get back to living the life you should be living. 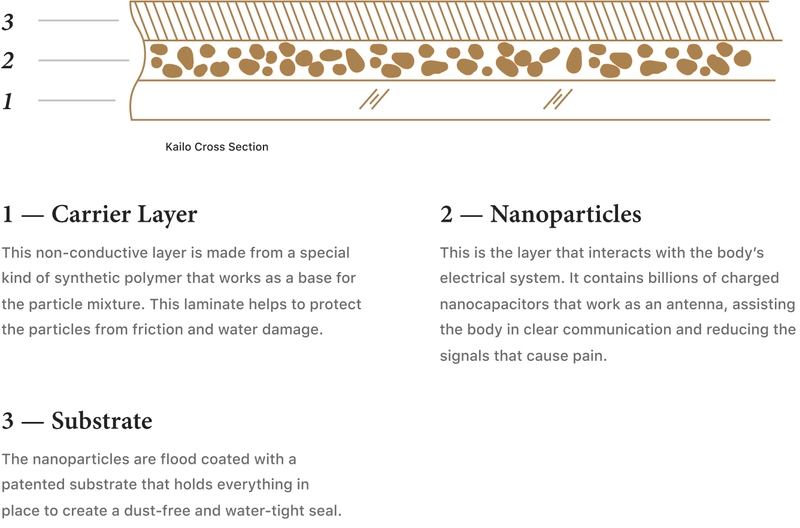 Let’s take a look inside Kailo’s innovative technology. It was invented as a leading-edge antenna technology and in a EUREKA! moment, was discovered to also help relieve pain. So what's inside a Kailo? What makes it work? As long as your Kailo is properly placed, it will continue to provide relief. Additionally, there is a lasting effect even after the Kailo is removed. We have use cases of people wearing it for a week and the positive effects lingering for days after removal. We also have many examples of the relief continuing for up to an hour after just wearing it for a few minutes. It likely depends on the kind of pain and the health of the person wearing it. And hundreds of other applications! These are some of the most common applications, but we have thousands of use cases. 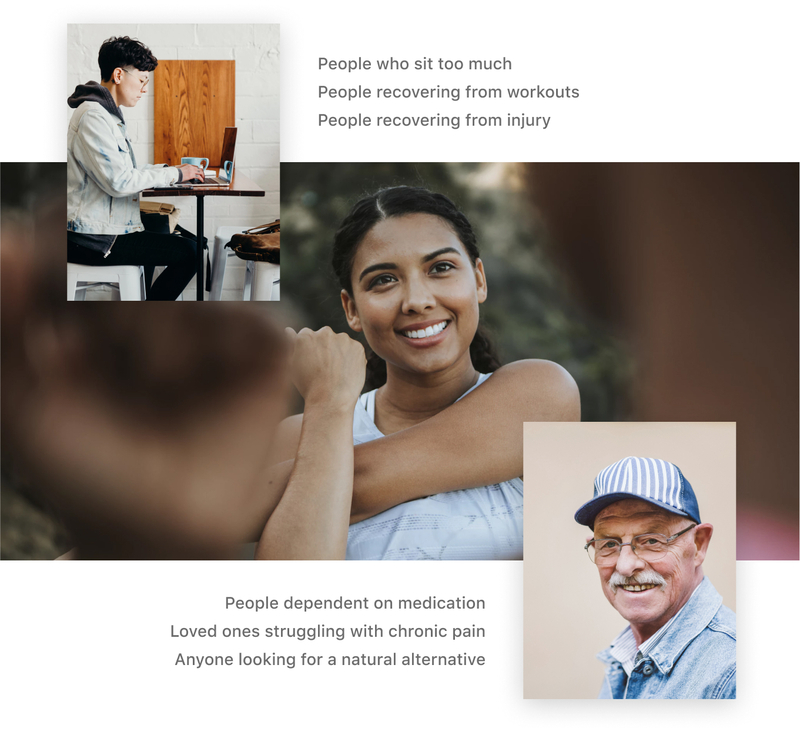 People use Kailo for everything from headaches and backaches, to menstrual cramps. Kailo has helped provide natural relief for pain in joints, muscles, and nerves. If you are wondering if Kailo can help you, we have a 100% money-back guarantee so it won’t hurt to give it a shot! Each Kailo comes with a small pack of adhesives that can be easily applied to the back of your Kailo for seamless application. When the adhesive loses its stick, simply peel it off and apply a new one for next time. If you don’t want to use the provided adhesives, feel free to use your favorite athletic or medical tape to hold your Kailo in place. Because the pain relief is dependent on your body’s nervous system pathways, there can often be a little trial and error when it comes to correct placement. We’ve found that when a friend or loved one helps you, it can shorten the amount of time needed to find the right spot. Kailo is known to start working within seconds, so it’s fairly easy to know if you’ve found the right spot. Simply move Kailo around in varying configurations until you find relief, then remove the adhesive backing and apply it to that location. 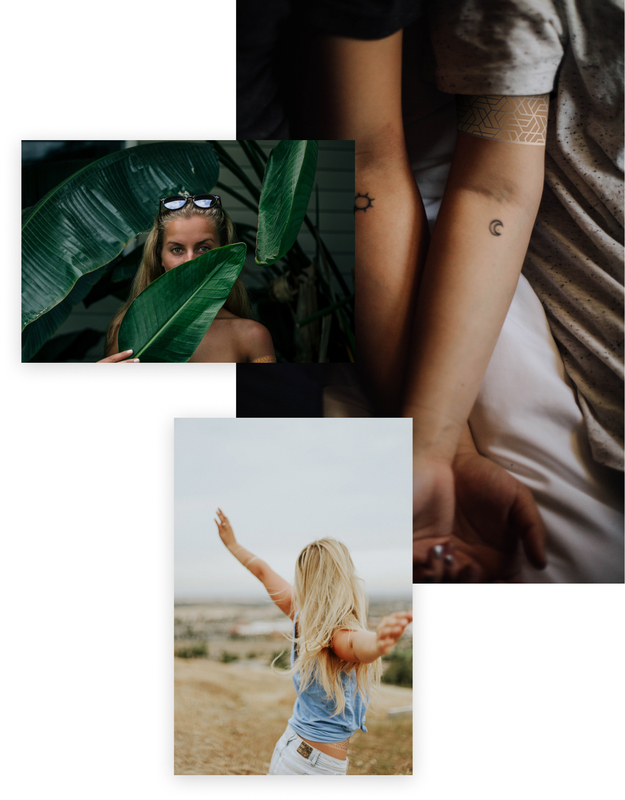 We’ll send a handy placement guide with your Kailo kit to help you find just the right spot. Kailo is watertight and sealed against the elements. Feel comfortable and free to wear Kailo during adverse weather conditions, while taking a shower, or even during an afternoon dip in the pool. Just be sure to keep it away from cleaning chemicals or other harmful substances that don’t play well with films and plastics. Kailo can be cleaned with mild soap and water. Because of the strength of the body’s electrical field, Kailo can be worn directly on the skin as well as over fitted clothing. We’ve even seen it work over sweatshirts. This means you have some flexibility of where you place it and how it works best with your activities. Humanity has changed. 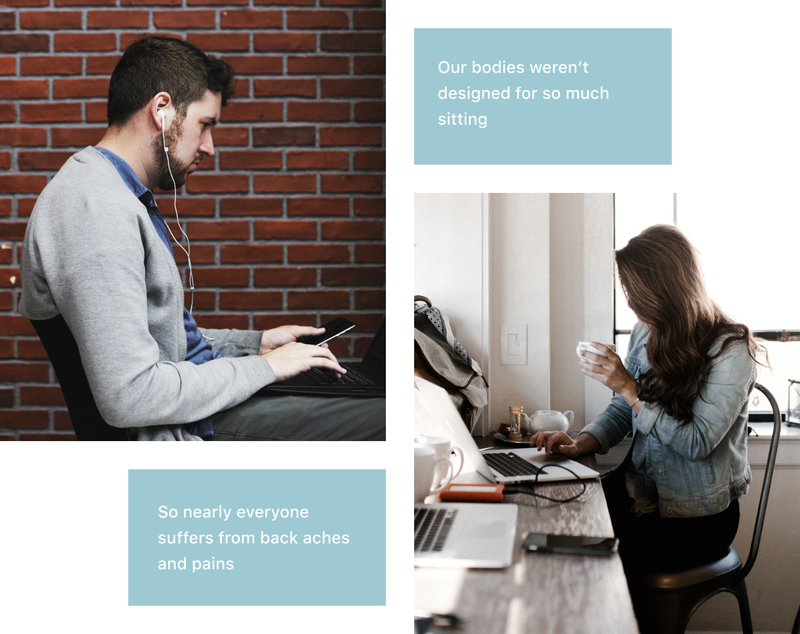 Our bodies weren’t designed to be so sedentary but we now spend more time sitting than at any time in history (you’re probably sitting right now). Because of that, nearly every single one of us suffers from pain. And as we get older, it gets more common. Standing desks, expensive chairs, gel pads — we’ve all tried them. Unfortunately, too often, the answer to pain is to open a bottle of pills. None of us want to be dependent on medication for the rest of our lives. 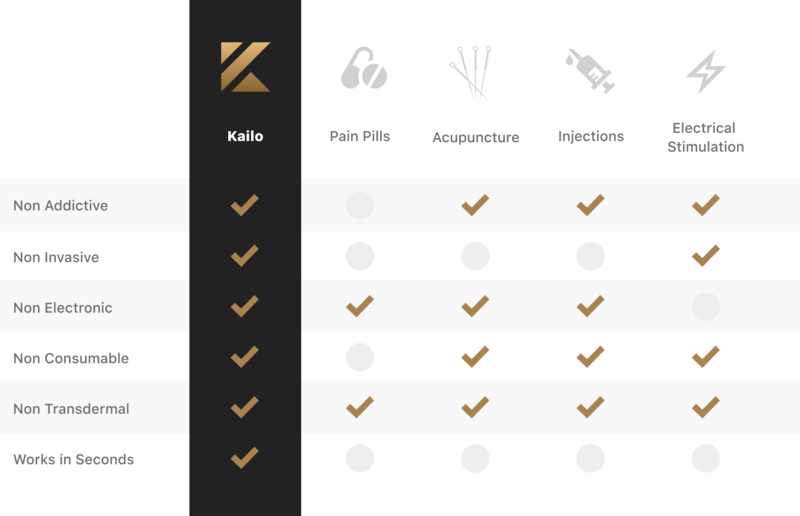 Kailo is a compelling and natural alternative to the invasive, electronic, and addictive sources of pain relief widely available today. Kailo is very safe and does not transfer anything into your body! Kailo only enhances your own body’s electrical signals to help its own ability to provide relief, naturally. If you’re not satisfied with your Kailo for any reason, you’re free to send it back for a full refund within the first 14 days. Because of our 87% success rate, our only request is that you call us first and let us help you with the proper placement. In almost every case where Kailo seemed to not be working, it was only a lack of finding the right spot for the affected area. Our goal isn’t to just sell a product but to help people find real, lasting relief. We’d love the opportunity to help you too! 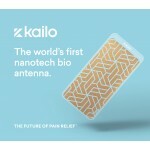 Kailo is a nanocapacitor device that looks and acts like a patch. Kailo can be placed directly on the skin, or close to the body but separated by clothing or a placement accessory. Kailo does not have to touch the skin to be effective. What if Kailo doesn’t work for me? 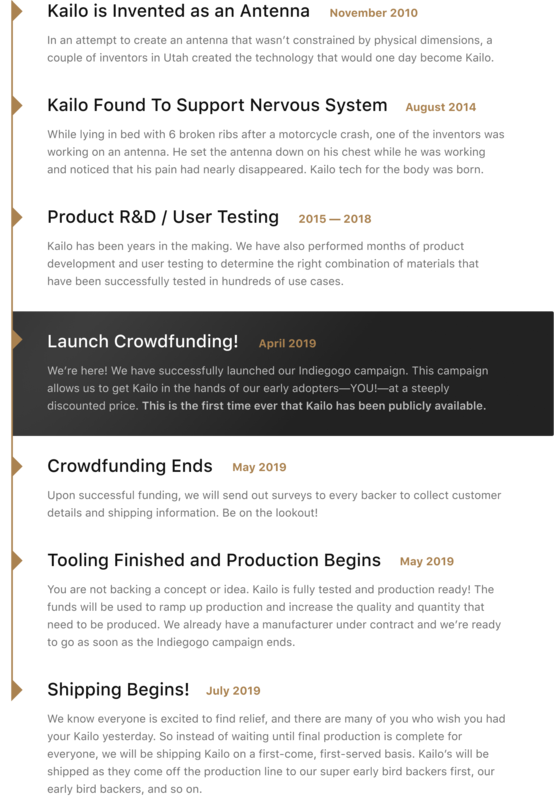 Kailo is far more than just a business for us, it's changed thousands of lives already. We offer a no-hassle, 100% money-back guarantee. If you feel Kailo isn't working for you within 14 days,​ we'll gladly take it back. Over 87% of our customers have found an increase in comfort. We may be able to help you make adjustments to how you use Kailo in order to find success. Are the people in your testimonials real customers? 100% Absolutely. 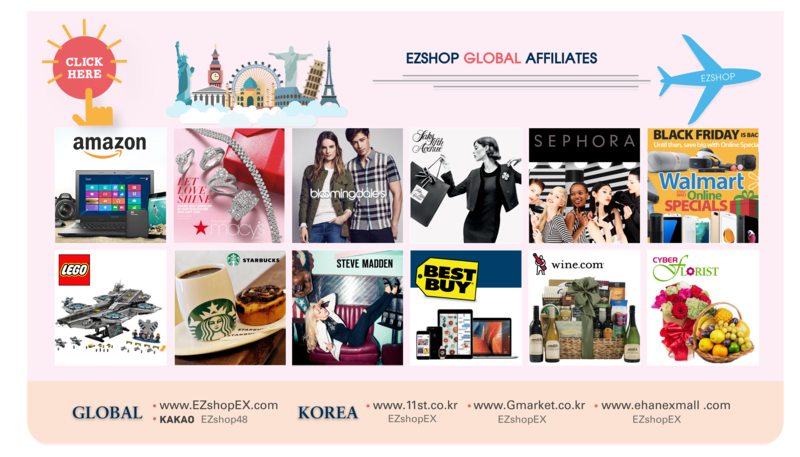 In addition, the few testimonials you read on the site are only scratching the surface. We have thousands of cases of people using our technology to improve their lives. Our team uses them every day as a matter of practicality. 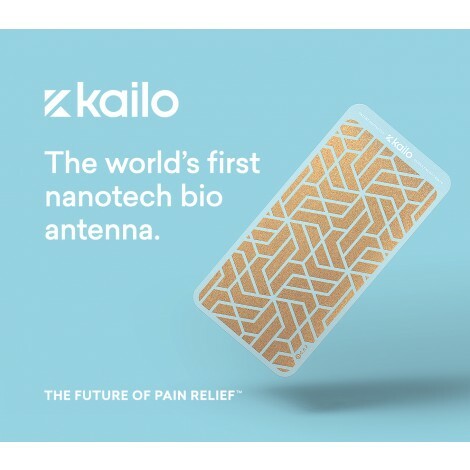 Kailo is genuinely game-changing technology. Order yours today. Do you plug them in? Is there a battery? Kailo uses ambient electricity in the natural environment to work. The human body is run on electrical signals. Kailo interacts with those signals and increases the body's innate ability to fight pain. The nanocapacitors in Kailo are used in patented high-tech applications like signal transmission and other antenna technology. The effectiveness of Kailo on the human body was sort of a happy accident. Kailo boosts the natural signals of the body and helps the brain communicate with disrupted areas more effectively. We offer a no-hassle, 100% money-back guarantee. If you feel Kailo isn't working for you, we'll gladly take it back. Over 87% of our customers have found relief from pain and a boost in performance, recovery time, etc. We may be able to help you make adjustments to how you use Kailo in order to find success. Our staff can help you get the relief you're looking for. Do the patches ever "wear out?" Kailo is very durable. Treated properly, Kailo may last for years before needing replacement. Kailo is a great value. No other pain relief on the market offers so much potential for a one-time purchase. We're based in the heart of Silicon Slopes, Utah. 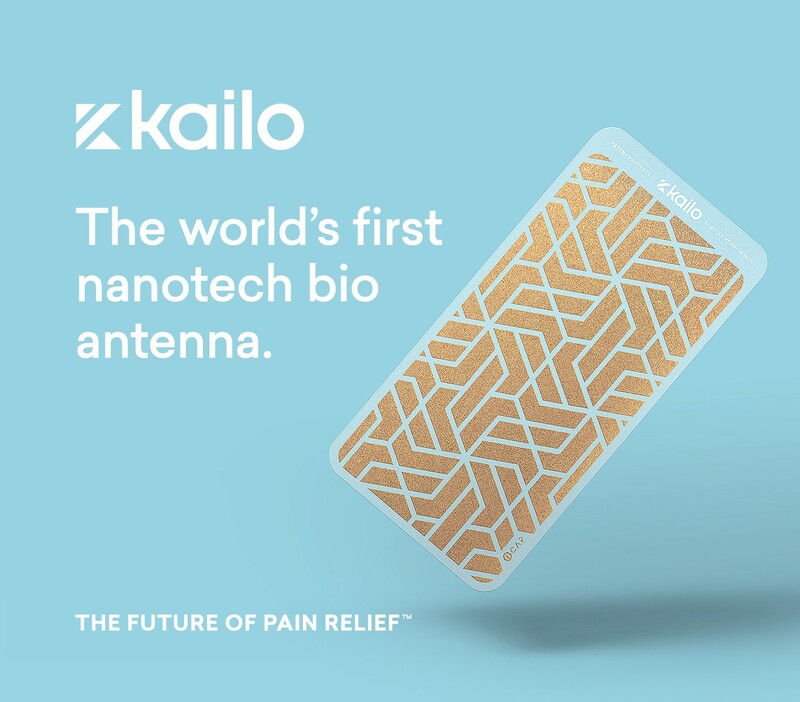 Kailo is designed, engineered, and manufactured in Utah — the birth place of television, artificial heart, electric traffic lights, and Frisbee. We're proud to be part of the innovative, hard-working, and kind culture of the Beehive State. Can a Kailo get wet? Each Kailo is encased by layers of a polycarbonate substrate on one side and a dielectric coating on the other. They have been tested for water-resistance and full submersion. After use in water, simply dab it with a clean, dry towel and allow it to air dry.